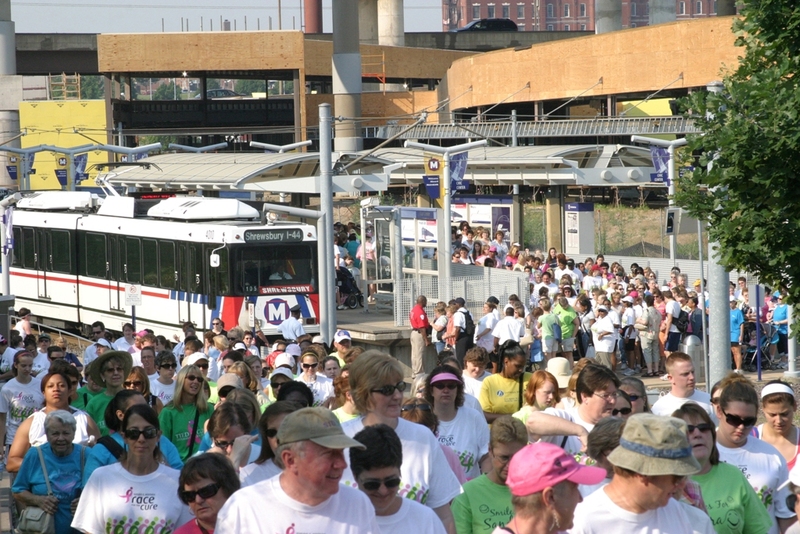 Metro Transit will provide enhanced MetroLink service this Saturday, June 15, from 6 a.m. until noon to accommodate the large crowd of participants and volunteers attending the 2013 Komen St. Louis Race for the Cure in downtown St. Louis. Every year, thousands of participants and volunteers avoid the street closures, traffic jams and parking issues in downtown St. Louis by parking at one of Metro’s free Park-Ride lots and taking MetroLink or MetroBus to the event. Some of the more popular Park-Ride lots like North Hanley, Shrewsbury and Fairview Heights fill up quickly, so customers may want to think about utilizing other Park-Ride lots like Swansea in Illinois or the Brentwood I-64 garage in Missouri. Metro will have extra staff to assist passengers Saturday morning, including ticket agents set up at the highest traffic MetroLink Stations: North Hanley, Delmar Loop, Forest Park-DeBaliviere, Central West End, Clayton, Brentwood I-64, Shrewsbury Lansdowne I-44, Civic Center, East Riverfront, 5th & Missouri, Fairview Heights, Swansea, Memorial Hospital, College, and Shiloh-Scott. The ticket agents will accept cash only, no credit or debit cards. Metro passes can be purchased with credit and debit cards at the Ticket Vending Machines at MetroLink Stations. However, customers will not be able to use their credit or debit cards to purchase passes at the Ticket Vending Machines at Emerson Park MetroLink Station on Saturday because of a power issue there. Passengers who plan to board at Emerson Park may want to purchase passes at another MetroLink station in advance and then validate their tickets on Saturday prior to boarding the train. They can also purchase Metro passes with cash Saturday at the Emerson Park Station. 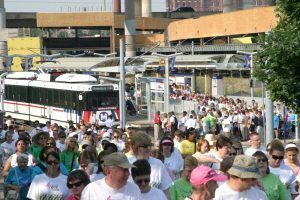 Some MetroBus routes will be detoured starting starting tomorrow morning (June 14) because of downtown street closures for the Komen St. Louis Race for the Cure. Reroute information is posted under the Rider Alerts section of Metro’s website. Participants who plan to take Metro to the event Saturday can also plan their trip on the website. Metro Transit Information representatives are available to answer questions tomorrow, June 14 from 7:30 a.m. until 4:30 p.m. at 314-231-2345 from Missouri or 618-271-2345 from Illinois. Metro is proud to be one of the sponsors of the 2013 Komen St. Louis Race for the Cure.